GameFly wants to help the users of its mobile app broaden their social life. The video game rental service updated its eponymous iOS app this week, adding social networking capabilities aimed at helping gamers connect with one another. GameFly bills itself as a Netflix for video games. With the service, members rent video games, which arrive through the mail. As with Netflix, GameFly members can keep the rental for as long as they like, returning it via the mail in order to move on to the next game in their queue. GameFly’s mobile app lets subscribers look up video game news and information, watch trailers, and manage their rental queues from their iPhone, iPod touch, or iPad. 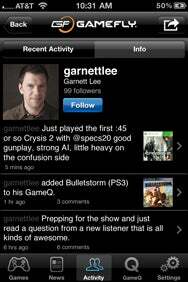 GameFly 2.0, released this week, adds a social element to the app. Users can create profile pages for themselves and browse profiles of other GameFly users. From the app’s Activity tab, users can post comments about games and respond to other users’ posts. The app also adapts the Twitter-esque feature of being able to follow other gamers. The features should help GameFly members discover new people to challenge via Xbox Live, Wii, and PlayStation Network, according to GameFly co-founder and senior vice president of business development and content Sean Spector. “It’s really about connecting gamers to games and game behavior,” Spector said. The GameFly iOS app is a free download from the App Store. The service itself starts at $16 a month for a one-game-at-a-time rental.